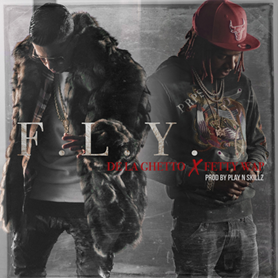 Undisputed Crossover King of Spanish R&B and Hip-Hop De La Ghetto released his new sure-fire hit single, “F.L.Y.” on Warner Music (April 20), featuring rap superstar Fetty Wap. The track spotlights De La Ghetto’s double-edged lyrical genius, melodic vocals and rapid fire flow mixed with Fetty Wap’sdistinguished vocals and rhyming style. De La Ghetto’s long awaited soon to be released new album, Mi Movimiento, features collaborations with fellow Latin urban superstars J Balvin, Maluma and Wisin. Hehas also collaborated previously with Latin icons Daddy Yankee, Nicky Jam, J Balvin, Wisin & Yandel and other big name artists. De La Ghetto is set to perform at the 2018 Billboard Latin Music Awards in Las Vegas on April 26th, alongside Sofia Reyes on her track "1,2,3." The hit single “1,2,3” alongside Sofia Reyes and Jason Derulo released in February, entered the Viral 50 Chart in more than 50 countries and became an explosive single in the first 5 days. De La Ghetto has garnered a devout following among Latin and English speakers thanks to sold-out tours throughout the United States and Latin America - including a packed house at the legendary Coliseo de Puerto Rico arena - and show-stopping performances at major radio festivals like Calibash in Los Angeles and Las Vegas, Mega Mezcla in New York City, and Miami Bash. De La Ghetto’s status as a premier hit maker and hip-hop luminary is undeniable. The music video for De La Ghetto’s previous single, “La Formula,” featuring global megastar Daddy Yankee and rising hit-maker Ozuna, surpassed an extraordinary 200 million views on YouTube. De La Ghetto’s social media boasts 4.7 millionInstagram fans, 1.95 million Twitter followers and 5.6 million Facebook followers - a testament to his universal popularity. De La Ghetto released his debut album, Masacre Musical, in 2008. In 2013, he released the mix tape Geezy Boyz.